Use Google Maps or the step-by-step driving directions below to find your way to our facilities. · Exit the airport via Route 20 heading east. · Take the I-91 South exit (right lane). · Take I-91 South to I-291 East (Exit 35A). · Take a left onto Route 5 North. · Take the second right onto Pleasant Valley Road. · Take the first left onto Nutmeg Road South. · 8 Nutmeg Road South is the first building on the right and has three driveways. 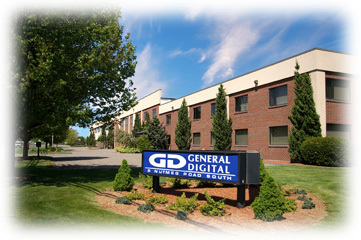 · Take a right into the third driveway at the GENERAL DIGITAL sign. · The main entrance is on the north face in the center of the building. · Take I-95 North to I-91 North (Exit 48, left exit). · Continue north on I-91 through Hartford. · Take Exit 35A onto I-291 East. · From I-84 East, take exit 61 onto I-291 West. · Take I-90 West (Massachusetts Turnpike) to I-84 West (Exit 9). · Take Exit 61 onto I-291 West.